September 2010 PDF of the Twin Cities IWW branch's newsletter. 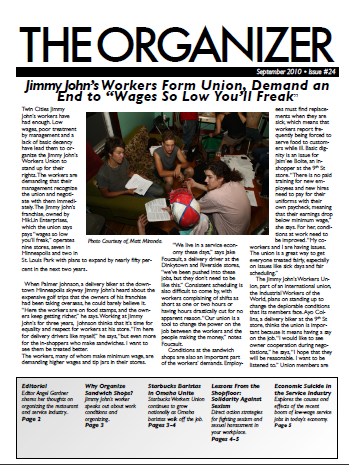 Editor Angel Gardner shares her thoughts on organizing the restaurant and service industry..
Jimmy John’s worker speaks out about work conditions and organizing..
Starbucks Workers Union continues to grow nationally as Omaha baristas walk off the job. Direct action strategies for fighting sexism and sexual harassment in your workplace. Explores the causes and effects of the recent boom of low-wage service jobs in today’s economy. An analyses of socialist electoralism in Minneapolis, by John O'Reilly. You must help yourself: Neo-liberal geographies and worker insurgency in Osaka.